Esplora il meglio che Philadelphia ha da offrire in questo tour hop-on hop-off della città. 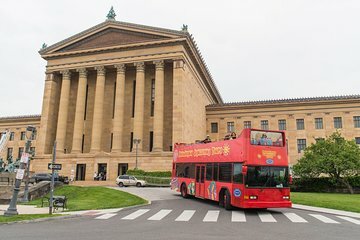 Visita le 27 principali attrazioni di Filadelfia - come la Liberty Bell, l'Independence Hall e la Zecca degli Stati Uniti - su un circuito di 90 minuti in un autobus a due piani a cielo aperto. Seleziona un pass singolo o di più giorni, poi sali a bordo in una delle 27 fermate e conosci la città in modo personalizzato, con una narrazione live onboard. Scopri la storia e il patrimonio di una delle città più antiche d'America. I am relatively new to the area. I’ve visited Philly from time to time, but I knew I didn’t know it well enough to give my visiting friend a tour. Our tour guide was knowledgeable, entertaining, and funny. I would definitely take the tour again when another friend comes to town. A good way for a first-timer to get an overview of what the city has to offer. We had quite short wait times when we had finished at the sites we chose to visit, and the guides on the buses were very helpful and had lots of stories to tell their passengers. I would recommend this for your first day. I had a friend visit last weekend, who lives in Orlando, and who works at that big theme park there. When I heard she wanted to do Philly, I worried, but the Hop On, Hop Off double decker bus was perfect. We took the whole 90 minute tour first, so we could decide at what points we’d hop on and off over the three days. It was the perfect way to see many, many attractions. We experienced several different tour guides. Each was well informed, and we learned different things from each. Well worth the cost. Close, convenient parking. I highly recommend using Hop On, Hop Off around which to build your visit to Philly! The tour was good, we had two different tour guides, both were good in different ways. The only disappointment was that we were told the wrong time for the last bus of the day so we ended up not being able to take the bus the second day to where we wanted to go and it was to far to walk..
We had the best time my mom and her great grandson there first time riding a double decker bus they both just loved it, would do it again. My grandson get car sick but for some reason this did not get him sick at all. CiCi the tour guide and Nate the driver were nothing short of amazing!!! CiCi kept us informed and entertained at the same time. She made sure we knew where to get local food . GREAT SERVICE. It was great!!! We took our 5 kids everyone enjoyed it. They really knew their stuff. once we had our voucher validated we decided to go round all 27 stops taking in the whole tour. The tour guide whose name we have unfortunately forgotten was very good and informative. We saw all the sights including the famed rocky steps and the rocky statue. After the tour we visited the liberty bell exhibition and independence hall. We returned to the bus and got off in the city to look around and do some shopping. After having a philly cheesesteak in the hard rock café we returned to the station to get the train back to new York where we were staying. I would recommend using the hop-on hop-off bus as its the best way to get about and see the sights. This was very fun. The guides were very knowledgeable. I would highly recommend it! If sitting in the open air upper deck you had to duck many times to avoid getting smacked in the face by branches. The tour guide did give us a heads up, but it happened a little to often to categorize this better then 3 stars.